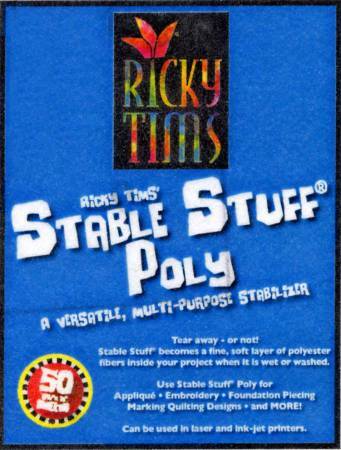 Ricky Tims introduces a versatile, multi-purpose, polyester-based stabilizer called Stable Stuff® Poly. You can tear it away - or not! You can leave it on the underside of your work. If you wet or wash your finished project, Stable Stuff® Poly becomes a fine,soft layer of unnoticeable polyester fibers inside your project. Use Ricky Tims' Stable Stuff Poly for applique', embroidery, foundation piecing, and more. Ready to go for use in a copy machine, ink jet printer or laser printer! Guidelines for use are included. 50ct 8 1/2in x 11in per package.